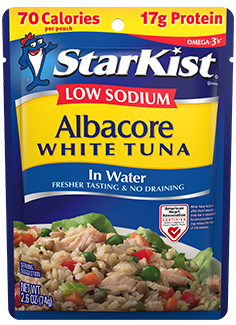 Select cuts of albacore tuna hand packed in our StarKist Flavor Fresh Pouch® - with lower sodium! The mild tuna flavor and sodium content (only 70 mg per 2.6 oz. serving) makes this a perfect protein choice for anyone looking for low-sodium options. ++StarKist® Low Sodium Albacore White Tuna in Water has 180 mg per serving of EPA and DHA omega-3's combined.